An intensive care unit (ICU) receives obstetric patients with a variety of medical and surgical emergencies and provides supportive care for patients who suffer obstetric complications. These patients needing intensive care present an exclusive challenge both for the obstetrician as well as the intensivist. Measurement of obstetric critical care is a real challenge. The pattern of admission varies widely among countries with different standards of obstetric care. In developing countries such as India, due to scarcity of ICU resources, maternal morbidity and mortality for such patients is high. Also, in Indian healthcare with limited availability of well-equipped critical care units and ICU bed strength typically <5% of total hospital beds in majority of advanced centers, it becomes difficult to obtain an ICU bed for many of the deserving critically ill patients. We designed a prospective study to examine the pattern of admission, prevalence, causes, and the outcomes of critically ill obstetric patients admitted to an Indian ICU. Also, we aimed to determine the predictors of mortality in obstetric patients needing ICU care. A prospective study was designed to study all obstetric ICU admissions over a period of 18 months from January 2015 to June 2016. The study was conducted in the multispecialty ICU of a tertiary care hospital in India after approval by the Hospital Ethics Board. The hospital is a 350-bedded Joint Commission International (JCI)-accredited hospital with referrals from across North India. The hospital has 24 medical/surgical and 7 neurology/neurosurgical ICU beds and 18 high-dependency beds, which are staffed by full-time qualified and experienced intensivists 24 h a day. Obstetric ICU specifically designed for pregnant and postpartum women is not available. Any obstetric patient who needs ICU care with any impending obstetrical emergency, respiratory distress, hemodynamic instability, active bleed, altered sensorium, seizures, etc., is admitted to the multispecialty ICU. The obstetric patient in ICU is jointly managed by the admitting obstetrician and the intensivist. All obstetric patients, i.e., pregnant and within 6 weeks postpartum, who were admitted in the ICU during the study period of 18 months for any problem were included in the study. The data collected included the demographics, obstetric, and medical history, including admitting diagnosis, gestation age, gravida status, the mode of delivery, any obstetric complication, and outcome of baby delivered. The ICU-related data included the critical illness severity scores, organ failures, any sepsis, treatment given during ICU admission, including mechanical ventilation, inotropic support, and the ICU stay. The patients were followed up to 28 days in obstetric outpatient department. The hospital stay and the final outcome of the patient were noted. The demographic data were expressed as mean ± standard deviation (SD) of the mean, median for continuous variables, and as frequencies and percentages for categorical variables. Comparison of quantitative variables between the study groups was done using Student's t-test and Mann–Whitney U- test for independent samples for parametric and nonparametric data, respectively. For comparing categorical data, Chi-square (χ2) test was performed and Exact test was used when the expected frequency is <5. Regression analysis was done to predict the factors affecting the mortality. Areas under the receiver operating characteristic (ROC) curves were calculated, and ROC curves were plotted, respectively, to detect mortality factors and to identify SOFA and APACHE scores cutoffs corresponding to the intersection of sensitivity and specificity curves. A probability value (P- value) <0.05 was considered statistically significant. All statistical calculations were done using Statistical Package for the Social Sciences (SPSS) version 17, statistical program for Microsoft Windows. A total of 48 consecutive obstetric patients were admitted in the ICU during the study period of 18 months. Of these, three patients died in the ICU and one died after 3 days of discharge from ICU, whereas 44 were discharged home. Thus, the overall in-hospital mortality in our study population was 8.3%. The demographic profile of patients is as shown in [Table 1]. The mean age of study patients was 29.27 ± 5.910 years, 28.95 ± 5.34 years for discharge patients and 30.36 ± 7.72 years for dead patients. Age was not associated with mortality (P = 0.491). 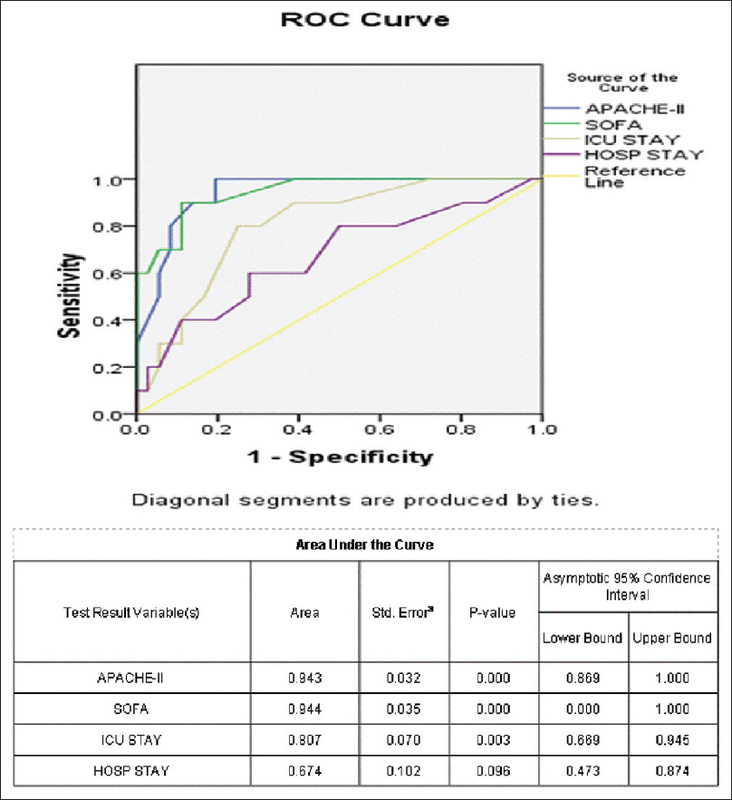 The mean APACHE-II score of the study patients was 12.77 ± 7.553. On comparing APACHE-II score in discharge versus dead patients, it was found to be significantly associated with mortality (10.11 ± 5.33 versus 22.60 ± 6.45, P = 0.000). The overall SOFA score was 6.36 ± 4.235, which was also found to be a significant predictor of mortality in obstetric patients (4.81 ± 2.60 versus 12.10 ± 4.25, P = 0.000) [Table 2]. The commonest reason for ICU admission in our study was postpartum hemorrhage (PPH), where 11 patients had PPH (23%), 10 had pregnancy-related hypertensive diseases (21%), 8 had cardiac problems, 5 patients had acute respiratory distress syndrome (ARDS), of which one patient was put on extracorporeal membrane oxygenation (ECMO) support and three had septic abortion [Figure 1]. Most of the patients (n = 34, 70%) were admitted in third trimester, whereas only two patients (5%) got admitted during the first trimester. Of the total patients, 65% underwent lower segment cesarean section (LSCS) (n = 31), 25% had normal delivery (n = 12), and 10% patients had to undergo termination of pregnancy (n = 5). 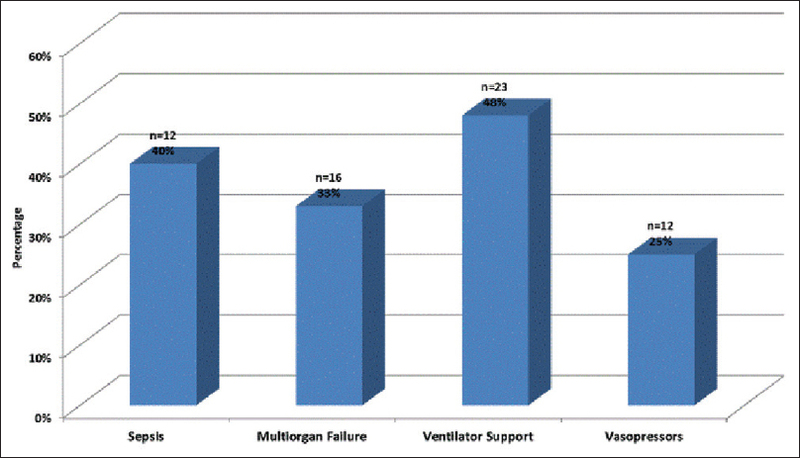 During ICU admission, 40% of patients had sepsis (n = 19), 33% had multiorgan failure (n = 16), 48% required ventilator support (n = 23), and 25% needed vasopressors (n = 12) [Figure 2]. The mean number of organs involved in patients having multiorgan failure were 1.15 ± 1.255. Five patients of PPH eventually had disseminated intravascular coagulopathy, out of which two received recombinant factor VII (rFVII). The mean ICU stay was 6.90 ± 6.883 days, which was also a significant mortality predictor in our patients (5.16 ± 4.93 days in discharge patients versus 12.73 ± 9.31 days in dead patients, P = 0.001). The hospital stay was also found to predict mortality in obstetric patients in our study. The mean hospital stay was 9.72 ± 6.930 days (8.31 ± 5.26 days in discharge patients versus 14.36 ± 9.65 days in dead patients, P = 0.010) [Table 2]. In analyses that compared the ability of critical illness scores to predict the mortality, area under the ROC curve (AUC) for the SOFA was not much greater than that for the APACHE-II (AUC: 0.944 and 0.943, respectively) [Figure 3]. The SOFA score yielded the best discrimination accuracy (AUC: 0.944, confidence interval (CI): 0.00–1.00; P < 0.0001), followed by the APACHE model (AUC: 0.943, CI: 0.869–1.00; P < 0.0001). However, the ICU stay factor was a stronger predictor of incident mortality than the hospital stay factor (P = 0.003). ROC curves for the hospital stay did not show good discrimination accuracies for predicting mortality. Of the ICU treatment modalities, only multiorgan failure was a predictor of mortality (P = 0.017) [Table 3]. Varying maternal mortality has been reported in obstetric ICU population in the literature, from as low as nil in an Australian ICU by Sriram to 40% reported by Tempe et al. in developing country such as India.,,,,,,,, In our study in an Indian ICU, we observed an overall mortality of 8.3%. The maternal mortality reported in the literature is significantly higher in the developing countries (50% reported by Osinaike in Nigeria, 40.35% by Tempe in India) as compared to the developed countries (0% by Lapinsky in a Canadian study, 3.5% in a Dutch maternity unit by Zwart, and 11% by Vasquez).,,,, Higher maternal mortality rates in developing countries have been attributed to treatment by quacks, low socioeconomic status, nonexistent antenatal care, low hematocrit, and under-nourishment in obstetric patients. Most Indian studies reporting higher mortality rate in obstetric patients are from government setups unlike the present study conducted in a tertiary care referral corporate hospital ICU. The lower mortality rates in the present study might be because of urban referrals in our institute who generally belong to a good socioeconomic strata and have good antenatal care. Also, the state-of-the-art facilities such as ECMO, continuous renal replacement therapy in our ICU, similar to those in developed countries do improve the patient outcomes. The observed mortality rate (OMR) in our study was too low (8.3%) as compared to the predicted mortality rate (PMR) of ~15% as per the mean APACHE-II score and SOFA score in our study patients. It has been observed in the literature also that APACHE and SAPS II scoring systems overestimate mortality in obstetric patients and the OMR is much lower than the PMR. Muench in a 24-month analysis of obstetric patient data from a university medical center concluded that the APACHE-II scoring system is inaccurate for use in an obstetric population. He observed an actual mortality rate of 0% as compared to the PMR of 12.9% as per the APACHE-II score. Karnad in an Indian study also concluded that APACHE-II scores overpredict mortality rate. Vasquez in a retrospective cohort study of 161 patients observed a mortality of 11% as against 24% PMR. This overestimation of the risk could be attributed to reversibility of certain obstetric pathologies such as preeclampsia and hemorrhage with effective and timely management. Further, some of the criteria used for these scoring systems are based on physiological changes of pregnancy rather than on pathological changes. Age is one of the important prognostic factors. Mean age of the patients in the present study was 29.27 ± 5.91 years compared to the literatures.,,, Many researchers have found age to be a predictor of mortality, but we did not find any association of age with mortality. In most of the studies, age >30 years has been associated with mortality, whereas in our study, the mean age in both discharge patients and those who died was not high. Obstetrical complications can be life-threatening. Early detection and resuscitation is the key to successful management and optimal outcomes, which has been echoed in studies by Karnad and reviews in Cunningham and by Zeeman.,, In our study (similar to the literature) most of the parturients were admitted with obstetric hemorrhage during third trimester, unlike the studies from developed countries where the primary reason for admission is mostly hypertensive disorders such as pre-eclampsia and eclampsia.,,,,, Early surgical intervention, systemic use of oxytocin, ICU management with appropriate fluid replacement, blood transfusions, correction of coagulopathies, and even using rFVII possibly contributed to a better outcome in our patient group. Most of the literatures available on obstetric critically ill patients are descriptive observational studies reporting the outcomes of obstetric patients in ICU without looking for the mortality predictors.,,, We analyzed the demographic factors and ICU treatment modalities affecting mortality and found APACHE-II, SOFA score, ICU stay, hospital stay, and multiorgan failure predicted mortality in obstetric patients, but only APACHE-II, SOFA score, and ICU stay were strong predictors. Many factors have been correlated as predictors of mortality in obstetric population. Adeniran et al. in a Nigerian teaching university hospital reported patient's level of education, Glasgow Coma Scale (GCS) score, oxygen saturation, multiple organ failure at ICU admission, and the need for mechanical ventilation or inotropic drugs after admission as statistically significant predictors of maternal deaths. Bhadade in a prospective study of 122 obstetric patients in a teaching tertiary care hospital found that the outcome of the patient is correlated with the number of organ involvement at the time of admission. Maternal age >30 years, increasing parity, especially parity status of 3 or more, lack of prenatal care, delay in intensive care referral, low GCS, and high APACHE-II on admission were associated with significantly high mortality in critically ill obstetric population. Multiple organ failure has been reported to be a major predictor of mortality in critically ill obstetric patients by previous researchers, which was further validated in the current study. In a descriptive study on 90 patients, Jain found a significant correlation between number of organs failed and mortality. Harde, in postanesthesia care unit (PACU), also found multiorgan dysfunction syndrome to be terminal cause of death. Karnad, in a retrospective study of 450 obstetric patients in a multidisciplinary ICU in India, found on multivariate analysis an increased mortality rate with acute cardiovascular (odds ratio, 5.8), nervous system (odds ratio, 4.73), respiratory failure (odds ratio, 12.9), disseminated intravascular coagulation (odds ratio, 2.4), viral hepatitis (odds ratio, 5.8), intracranial hemorrhage (odds ratio, 5.4), absence of prenatal care (odds ratio, 1.94), and >24 h interval between onset of acute symptoms and ICU admission (odds ratio, 2.3) and concluded that multiple organ failure is common in obstetric patients and mortality rate increases with increasing organ failure. These findings consistent with the present study reflect that the severity of illness and poor recognition and management of complications reduce the chance of survival. Longer duration of ventilation and inotropic support have been associated with poor outcome in obstetric population, as shown in the literature by Osinaike et al. in a Nigerian study, Gupta et al. in a dedicated obstetric ICU, and Bhadade et al. in PACU.,, In the study by Gupta et al., 91.66% patients required inotropic support and 70.83% required ventilatory support. Although not statistically significant, the association of mortality with both these supports was considerable (10/22 and 9/17, respectively). Jain also found that one-third of obstetric patients requiring mechanical ventilation died. In a study of postoperative LSCS patients admitted to PACU, Harde concluded that the factors predicting poor outcome are needed for ventilatory support, longer duration of ventilation, and inotropic support. But in the present study, we did not find an association of any of the ICU parameters such as sepsis, inotropic, or ventilator support with mortality. This might be due to ongoing physiological and pathological processes in our patients and many factors affecting the mortality other than those studied. We acknowledge few limitations of our study. The major limitation of our study being a single-center study was that it was not feasible to validate our conclusions as the sample size was small (n = 48). ICU admission is a management-based criterion and therefore by definition leads to inclusion bias. A potential selection bias in our study could have been avoided, if demographic detail and cause of mortality that occurred outside the ICU during the period of study had been identified. The management of critically ill obstetric patients is difficult and requires detailed specific knowledge of both the physiological changes of pregnancy and the pathology. Henceforth, it requires intensive involvement and cooperation of both the intensivist and the obstetrician. Because the obstetric ICU admission is rare, the exposure of obstetric residents to critically ill patients is less, so there should be a mandatory short duration ICU posting during their residency. APACHE-II, SOFA scores, ICU stay, hospital stay, and multiorgan failure are associated with increased mortality in obstetric critically ill patients but only APACHE-II, SOFA scores, and ICU stay being statistically strong predictors. APACHE-II and SOFA scores overpredict mortality in obstetric patients and should not be routinely preferred as mortality predictors for obstetric patients. Early assessment and intervention of critically ill obstetrical patients with a team approach involving obstetricians and intensivists is ideal. All obstetric residents should have a mandatory short period ICU training. Yeolekar ME, Mehta S. ICU care in India – Status and challenges. J Assoc Physicians India 2008;56:221-2. Sriram S, Robertson MS. Critically ill obstetric patients in Australia: A retrospective audit of 8 years' experience in a tertiary Intensive Care Unit. Crit Care Resusc 2008;10:124. Harde M, Dave S, Wagh S, Gujjar P, Bhadade R, Bapat A, et al. Prospective evaluation of maternal morbidity and mortality in post-cesarean section patients admitted to postanesthesia Intensive Care Unit. J Anaesthesiol Clin Pharmacol 2014;30:508-13. Al-Suleiman SA, Qutub HO, Rahman J, Rahman MS. Obstetric admissions to the Intensive Care Unit: A 12-year review. Arch Gynecol Obstet 2006;274:4-8. Ashraf N, Mishra SK, Kundra P, Veena P, Soundaraghavan S, Habeebullah S, et al. Obstetric patients requiring intensive care: A one year retrospective study in a tertiary care institute in India. Anesthesiol Res Pract 2014;2014:789450. Kilpatrick SJ, Matthay MA. Obstetric patients requiring critical care. A five-year review. Chest 1992;101:1407-12. Chawla S, Nakra M, Mohan S, Nambiar BC, Agarwal R, Marwaha A, et al. Why do obstetric patients go to the ICU? A 3-year-study. Med J Armed Forces India 2013;69:134-7. Gombar S, Ahuja V, Jafra A. A retrospective analysis of obstetric patient's outcome in Intensive Care Unit of a tertiary care center. J Anaesthesiol Clin Pharmacol 2014;30:502-7. Osinaike B, Amanor-Boadu S, Sanusi A. Obstetric intensive care: A developing country experience. Internet J Anaesth 2005;10. Lapinsky SE, Kruczynski K, Seaward GR, Farine D, Grossman RF. Critical care management of the obstetric patient. Can J Anaesth 1997;44:325-9. Vasquez DN, Estenssoro E, Canales HS, Reina R, Saenz MG, Das Neves AV, et al. Clinical characteristics and outcomes of obstetric patients requiring ICU admission. Chest 2007;131:718-24. Gupta S, Naithani U, Doshi V, Bhargava V, Vijay BS. Obstetric critical care: A prospective analysis of clinical characteristics, predictability, and fetomaternal outcome in a new dedicated obstetric intensive care unit. Indian J Anaesth 2011;55:146-53. Knaus WA, Draper EA, Wagner DP, Zimmerman JE. APACHE II: A severity of disease classification system. Crit Care Med 1985;13:818-29. Muench MV, Baschat AA, Malinow AM, Mighty HE. Analysis of disease in the obstetric Intensive Care Unit at a university referral center: A 24-month review of prospective data. J Reprod Med 2008;53:914-20. Bhadade R, De' Souza R, More A, Harde M. Maternal outcomes in critically ill obstetrics patients: A unique challenge. Indian J Crit Care Med 2012;16:8-16. Cleary-Goldman J, Malone FD, Vidaver J, Ball RH, Nyberg DA, Comstock CH, et al. Impact of maternal age on obstetric outcome. Obstet Gynecol 2005;105:983-90. Cunningham FG. Obstetrics complications. In: Leveno KJ, Steven BL, Hauth JC, Rouse DJ, editors. Williams Obstetrics. 23rd ed. New-York: McGraw Hill; 2011. p. 706-841. Zeeman GG. Obstetric critical care: A blueprint for improved outcomes. Crit Care Med 2006;34:S208-14. el-Solh AA, Grant BJ. 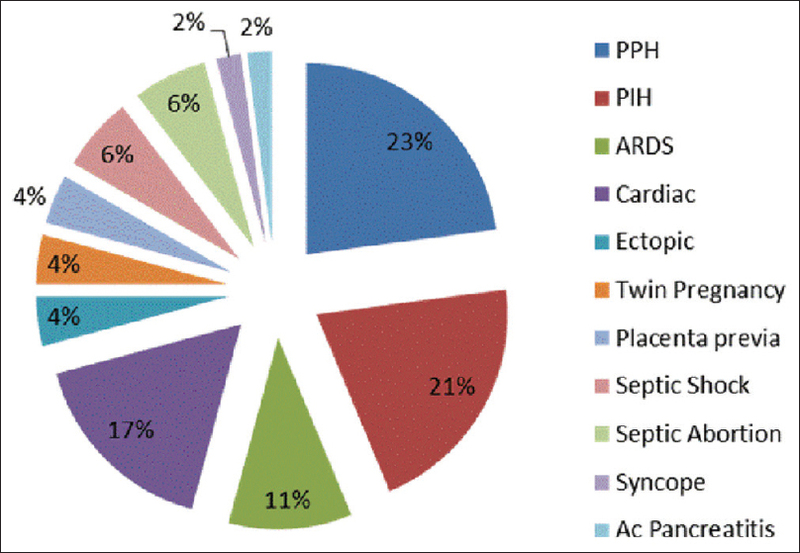 A comparison of severity of illness scoring systems for critically ill obstetric patients. Chest 1996;110:1299-304. Okafor UV, Efetie ER, Amucheazi A. Risk factors for maternal deaths in unplanned obstetric admissions to the Intensive Care Unit-lessons for Sub-Saharan Africa. Afr J Reprod Health 2011;15:51-4. Adeniran AS, Bolaji BO, Fawole AA, Oyedepo OO. Predictors of maternal mortality among critically ill obstetric patients. Malawi Med J 2015;27:16-9. Jain S, Guleria K, Vaid NB, Suneja A, Ahuja S. Predictors and outcome of obstetric admissions to Intensive Care Unit: A comparative study. Indian J Public Health 2016;60:159-63. Baskett TF, Sternadel J. Maternal intensive care and near-miss mortality in obstetrics. Br J Obstet Gynaecol 1998;105:981-4.